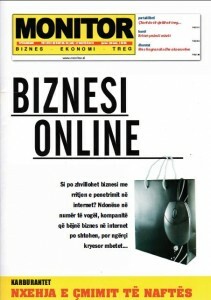 The title of the last issue of the year by the only financial magazine in Albania – “Monitor“, talked about developments, challenges and growth of the “Online Business” in Albania. This is something that I’m very keen on following up as it is an industry that I’ve already invested a lot of time and effort, so the issue had special interest for me. Albanian businesses and companies are starting to smart-up and recognize the need to present themselves online, at least through the creation of a website or even just a Facebook page, which is a huge step forward for many. However, there are still too many other businesses and organizations which are operating as though in the pre-internet age and don’t yet know or understand the necessity. This is partly because the people who manage Albanian businesses and organizations struggle personally with computer and internet literacy. However, those who understand the importance have figured out strategies or simply delegated this aspect of their business to someone who knows something about online services. Their number is growing and it’s not going to stop anytime soon. As I mentioned, the number of Albanian websites and Facebook pages going up is growing constantly and the growth is challenging those who are not doing something about it. I try to follow a good number of them, partly because I manage some and also because I want to be up-to-date with what’s going on. However, there are two main aspects that do concern me: one, is a lack of strategy and two, is a lack of consistency. Though most businesses and organizations operating in Albania do not need to invest much time and effort in establishing their online presence, except for a simple website, there are those who need to work on maintaining it a bit better. The number of out-dated pages is growing and though there are those who do have the resources to commit someone to take care of their online presence, the lack of a clear strategy creates issues. But even if there is not a clear long-term strategy for the maintenance and expansion of the online presence of a particular business or organization, there should at least be a level of consistency to keep information updated. Consistency is What Makes the Difference for Online Businesses! Personally, I’ve been managing online websites and a growing business (Albanian online bookstore) for several years now and one thing that I’ve understood and recognized over and over, is the fact that people who visit your site need to see some level of consistency in what you do. If it is just regular news and updates about your business or organization, than it has to be updated and posted on a regular basis so that people can start to respect your efforts and visit your site more often. I could go on-and-on about this, but just wanted to share some of my personal reflections spurred by the aforementioned article and personal/business involvement. I would encourage and welcome all your comments and suggestions below. Previous articleDropBox Now At Version 1, Even in Albania!